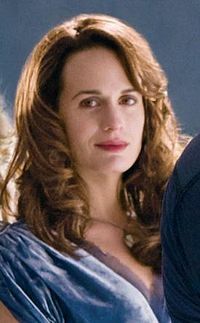 Esme Cullen (born Esme Anne Platt and later Esme Anne Evenson) is the motherly figure of the Cullens in the Twilight series by Stephenie Meyer. These books include Twilight, New Moon and Eclipse, as well as the upcoming Breaking Dawn and Midnight Sun. She is wife to Carlisle Cullen and a mother figure to Edward Cullen, Alice Cullen, Rosalie Hale, Emmett Cullen and Jasper Hale, her adopted children and fellow vampires. Esme was born some time in 1895. Little is known about her early life, except that she lived near the outskirts of Columbus. She met Dr. Carlisle Cullen for the first time when she was 16 and had just broken her leg climbing a tree. He soon moved out of town, but Esme never forgot the experience. While she initially wanted to move West to become a school teacher, she was pressured by her parents to remain and marry. At the age of 22 she married Charles Evenson, hoping to please her parents and willing to attempt to be happy, but soon realized that her husband was an abusive man. Her parents coached her to keep face, and much to her relief, her husband got drafted during World War I. A while after he came back she found out that she was pregnant, which gave her motive to run away. She fled north to live with her sister and became a teacher, and in 1921 her son was born, but he subsequently died a few days later of a lung infection. After the baby's death, Esme felt that she no longer had any reason to live. She tried to commit suicide by jumping off a cliff, and was presumed dead when she was brought into the morgue, though her heart was still beating. Dr. Cullen was working in the area at the time and recognized her as the happy, beautiful young girl he had treated ten years earlier. Carlisle decided to change her into a vampire as she was dying. Esme then married Carlisle and she joined the Cullen's coven. She openly welcomed Bella as a part of their "family" because of her warm nature, and has always treated the rest of the Cullens like this as well. She has a special spot in her heart for Edward because he was the first of her adoptive children, and he's been the "odd man out for so long" until he met Bella. Esme is an extremely warm individual who is gifted with the ability to love passionately. She is described as being 5'6", with caramel colored hair. Like the rest of the Cullen family she has golden eyes that fade to black when she is thirsty, pale skin that sparkles in the sunlight, and purple circles under her eyes that fade when she is well-fed. She has a heart-shaped face and her figure is described as being slender, but rounded and softer. When Bella first meets Esme, she says that she reminds her of Snow White. Bella also describes her as being similar to "one of the ingenues of the silent movie era." Esme has always had a maternal ache in her, allowing her to open her heart to her adoptive children and to Bella. According to Stephenie Meyer, in Esme's human life she was married to Charles Evenson. Esme was indifferent to Charles but decided to marry him, to please her parents, in 1917. She soon regretted the decision, as Charles became increasingly violent and abusive towards her. In 1920, Esme ran away from him after discovering that she was pregnant with their first child. Esme first met Carlisle at the age of 16, after breaking her leg while playing in a tree. 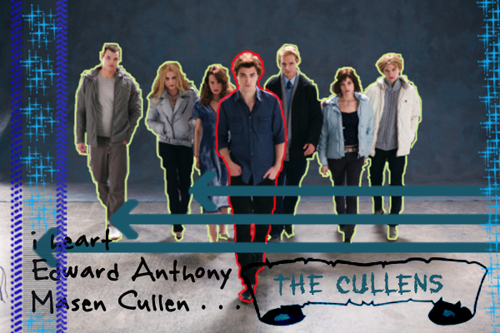 Later, Carlisle would save Esme from her failed suicide attempt, and make her part of his vampire family. They are completely in love, and have a relationship that is built on a strong spiritual and intellectual bond. Esme has never regretted becoming a vampire, as she is able to spend eternity with the man/vampire of her dreams.